Abstract: This project leverages data from the GTEx (a large rapid autopsy molecular profiling program of non-cancerous tissues) and the Cancer Genome Atlas (TCGA). We carried out an extensive literature review to identify SNPs (Single Nucleotide Polymorphism) associated with glioblastoma risk, which led to the identification of 27 risk loci. RNAseq gene expression profiles for Reads Per Kilo base of transcript per Million (RPKM) mapped reads for all normal brain tissue samples and all brain-specific SNP-gene associations (Cis and Trans) where obtained from the GTEx portal. We filtered our gene list using a P value of 0.05 and 0.1 and queried our filtered unique genes GBM mRNA expression data (u133 microarray only) in TCGA ,and clinical information relating to these patients was also derived. Subsequently, survival analysis was carried out using our genes of interests as exposures. 423 unique SNP-gene pairs comprising 279 unique genes associated with the identified loci were obtained after filtering. A total of 12 and 15 genes respectively. were derived after the COXPH survival analysis. From the survival analysis carried out, the three most significant genes were PRKCH, QSOX1 and ZBTB46 using specific criterias. For better visualization, box plots and density graphs were created for the 3 significant genes. This project highlights possible functional roles for known GBM risk SNPs by identifying 279 genes which are transcriptionally associated with these risk loci. Through survival analysis using patient outcome clinical data, it was identified that a subset of these genes may predict disease progression. 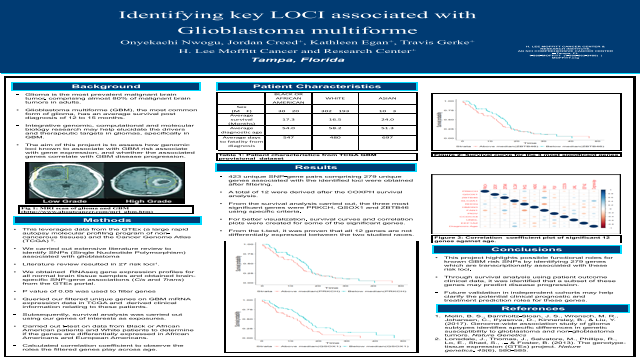 Future validation in independent cohorts may help clarify the potential clinical prognostic and treatment prediction roles for these genes.Summary: Glioma is the most prevalent malignant brain tumor, comprising almost 80% of malignant brain tumors in adults. Expected survival time in glioma is short, with Glioblastoma Multiforme (GBM), the most common form of glioma, having an average survival post diagnosis of 12 to 15 months. specifically in GBM. The aim this project is to assess how genomic loci known to associate with GBM risk associate with gene expression, and whether the associated genes correlate with GBM disease progression.References: Melin, B. S., Barnholtz-Sloan, J. S., Wrensch, M. R., Johansen, C., Il'yasova, D., Kinnersley, B., & Liu, Y. (2017). Genome-wide association study of glioma subtypes identifies specific differences in genetic susceptibility to glioblastoma and non-glioblastoma tumors. Nature Genetics. Lonsdale, J., Thomas, J., Salvatore, M., Phillips, R., Lo, E., Shad, S., ... & Foster, B. (2013). The genotype-tissue expression (GTEx) project. Nature genetics, 45(6), 580-585. Joehanes, Roby, et al. "Integrated genome-wide analysis of expression quantitative trait loci aids interpretation of genomic association studies." Genome biology 18.1 (2017): 16. Fox, J. (2002). Cox proportional-hazards regression for survival data. An R and S-PLUS companion to applied regression, 2002.